We woke early and packed the camp. We are getting better at this. I was cold and had not slept well - so was quite content to hear that we had a day with a lot of driving. I have been enchanted with my traveling companions. Marita and Jean-Daniel are a delight and talk about as much as I would want, but not all the time. Both have excellent and fluent English - and their French, which they use when together is so clear that I follow it easily if I bother to concentrate. We have discussed everything - both are thinkers and sharply intelligent and humorous. They even forgive my occasional Aussie crudeness when comments just slip out. 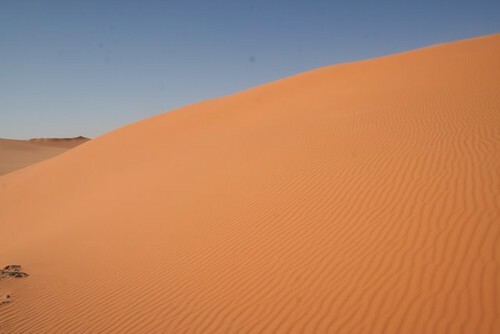 We had come to this side of Gilf Kebir so fast yesterday - approaching from the desert and running up the edge so I really did not have time to take it in. 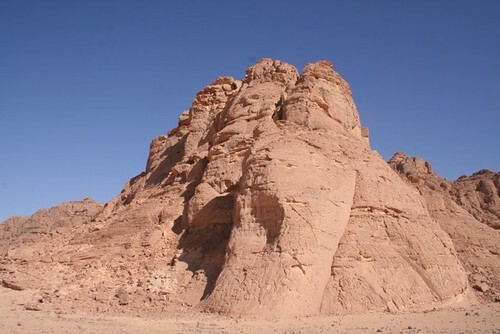 Leaving today we are hugging close to the high escarpments and can see the amazing stacked sandstone formations. Occasionally I took a shot straight through the windscreen from the backseat. I like the juxtaposition of Hani's strong hands, the rear view mirror, and the view in front. The small dot low in the middle is the lead car. We pulled in to see the Swimmers' Cave. This was featured in the movie The English Patient - and I loved the movie. I had always been enchanted by that cave - the deep slit that the shepherd edged into, down and around tight bends, with his flaming torch lighting stunning paintings on the walls. 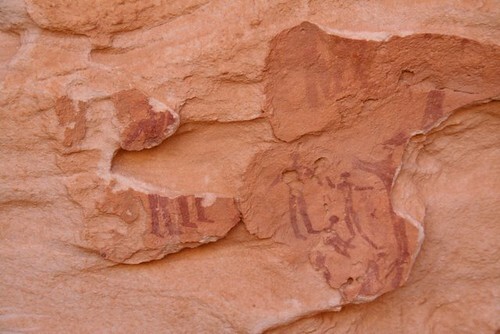 I thought the swimming figures beautiful and it was such an odd combination, swimmers in the middle of the desert. It implied a long time passing from then till now, and since 'now' cannot be shifted 'then' must be a very long time ago - a time when the climate was completely different, not just wet enough to sustain people but wet enough to swim. I had been warned. Heide had mentioned that it was a shame that people had damaged it, wetting the images - which might not have seen water for centuries - for better photos. Darkening seemed to imply that some had used oil. Apparently some images were actually missing. The cave was the greatest disappointment of the trip. For a start, the film lied. It was a shallow, low, shelter - curved and only slightly overhung like the other caves we have seen. There were no deep slits to climb through, no suggestion of darkness that might need a torch. I almost did not believe they had the right place. 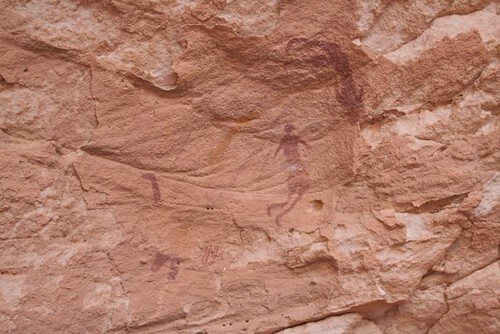 The paintings copied from these walls that now decorate the stunning foyer in the International Hot Springs Hotel in Bahariya are a great advance on anything left here - and in a way will remain the memorial for the Cave of the Swimmers. Worse - there is hardly anything left. The way the rock has formed left it cracked and flaky - though hard enough to last for centuries - as long as no-one tries to lever pieces off with tyre irons. It looks as if that has happened here again and again. It was devastating to see it and I wanted to avert my eyes and cry. There are great light scars in the wall of the rock, and shattered edges of figures swimming now into nowhere. And a view of the cave. I have no idea what might be done to protect other caves from similar damage. While tourism to these areas is difficult, it is also sought after by those who want to join an increasing movement to go to places others have not been. Tourism does marvelous things to increase awareness of what is of value on this earth of ours, but it also allows people to access things that are so precious and fragile. Our guides were wonderful. 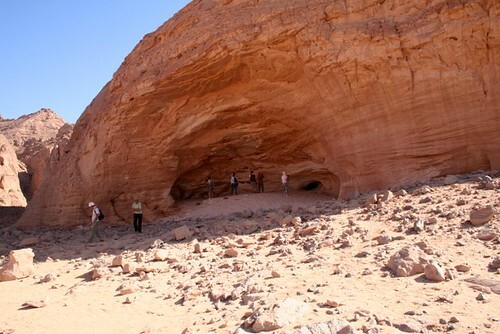 Mahmoud spoke with passion about guides 'from Cairo' who turn a blind eye to damage done - but he sees the existence of things like the caves which are the treasures of Gilf Kebir as essential to his continuing tours. The flower stones of the White Desert are disappearing (and I have some in a bowl in my lounge room, and each time I go back now I take a handful home). 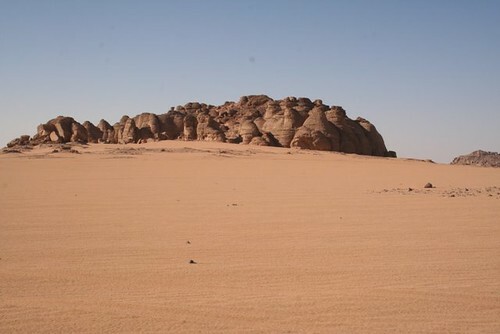 The silica glass which was formed over a huge area of Egyptian Desert in one extraordinary meteor strike, which shattered into shards which were worn silken and pitted by wind and sand, to glow like greenish and golden translucent jewels on the sands of the Great Sand Sea - most has been collected by tourists. I saw whole big monuments built in this natural glass in Tripoli, the capital city of Libya. I am now so afraid for places like the fairly recently found Fugini Cave - so stunning and haunting and beautiful. Special places in isolated areas afford unusual opportunities for plunder as there is unlikely to be an interruption. I would hate to see tourism banned as I found my whole trip so magical and it would be churlish to assume that all other tourists are worse than I am. We left the cave, all a bit quiet and distressed. Next stop was a camp used by the British - called the British Camp - funny about that! 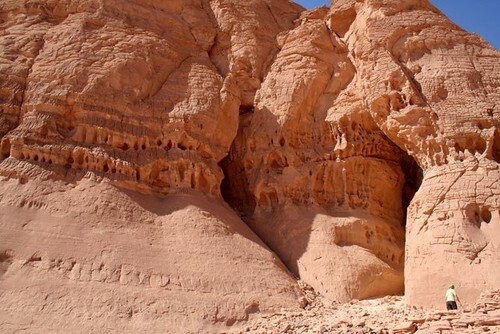 We had hooked out towards the desert (and Libya) again and the stacks of sandstone looked designed to be pigeon houses, pitted and worn and sculptured. The sky was deep ultramarine, and the sun was impossible to avoid with shadows sitting like tight puddles under the rocks. Stones in this area are like jewels - not silica glass, but softly translucent, white like thinned milk, cool apricot and cream colours, all etched by sand and wind so that if you lift them from the firmed-down gravel which embeds them they spread wider and rougher below the ground level, and are smooth and polished above. You hold them in you hand like eggs, and the polished side lets you look into the stones, the dull side below stops you seeing your own palm straight through them. We did not stay long - all of us needed toilet stops and we had bolted for varying degrees of cover. There was one track through the rocks and it is surprisingly hard to get away from twelve people all demanding a space of their own while pretending to search for pretty pebbles. Now we swung south again. 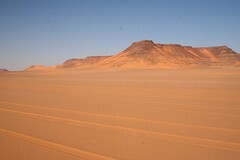 We ran parallel and fast through red sand with the Gilf in the distance. Further away the sand is firmer and less likely to trap Alberto's car. Fingers of the soft stuff work like speed humps and are surprisingly hard to see in mid-day sun with no shadows. Now the real fun starts. 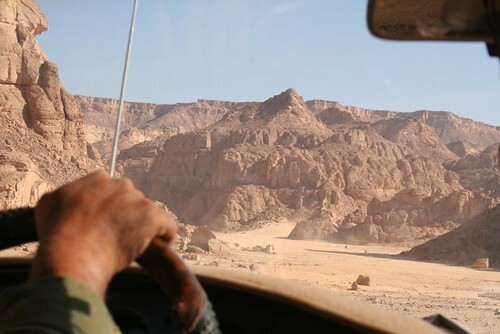 We were to cross the Gilf at the Aqaba Pass and this meant we had to climb to the top of the Gilf. I had asked rather tentatively about this. 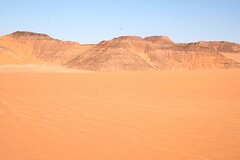 I was told it used to be very difficult but now the sand had filled the rocky places it was not so bad, but very soft. We went up, and up, and up, sand dune after sand dune. I lost count of how often we had to run back - not me actually if I am honest - but the other drivers and Mohamed the Captain - to dig out Alberto from soft sand. Going up with only two wheel drive was so difficult - lose speed even a little - and it was very steep and inevitable - and the back wheels simply drove the front wheels into the sand, then dug themselves in. I wish I had photos but it was impossible to hold on and use an SLR from the back seat with images that were even half way reasonable. At the top the world flattened out. 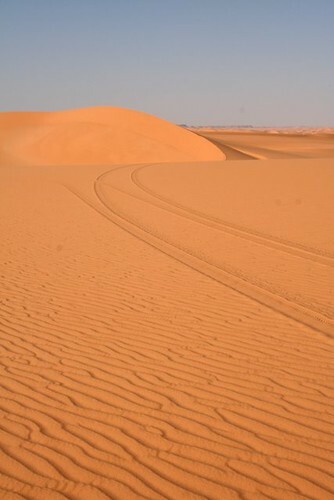 The plateau was rimmed with black ridges and high black peaks, but the sand between shifted and drifted in the keening wind that swept across it and swung at the cars, snatching especially at the higher and heavily laden kitchen car. It felt uneasily as if we were driving on a treadmill that just moved under the wheels so we went nowhere, and the scenery hardly changed. Up one side, and down the other. We dropped only one more dune. 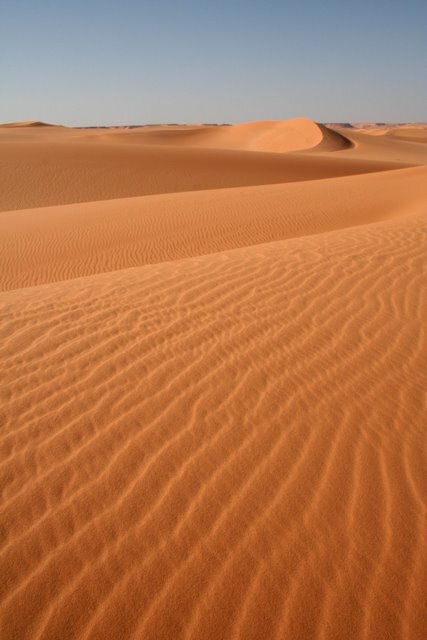 We threaded our way down through the sand, and came to a high ridge with a long sand slope below and wave after wave the Great Sand Sea stretched out pale red and gold before us. We swung around to face one of the most amazing views I will ever see. Without a wide angle lens I can give you only one direction, but it wrapped almost around us. The sand glowed golden as the sun when down, and ridges dropped and seemed to change shape as shadows shifted and sharpened - from the softest wash of grey-lilac to mauve to red-violet and finally deep grapey purples. 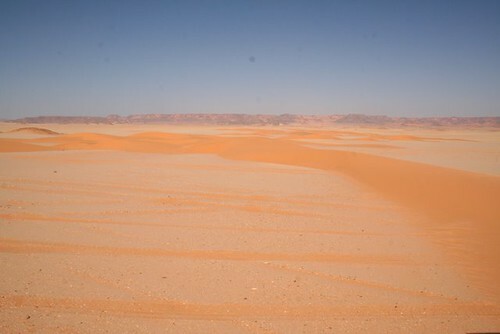 The light cooled on the sand as the heat sank from the air and the cold slammed down on us. I did not put up a tent. 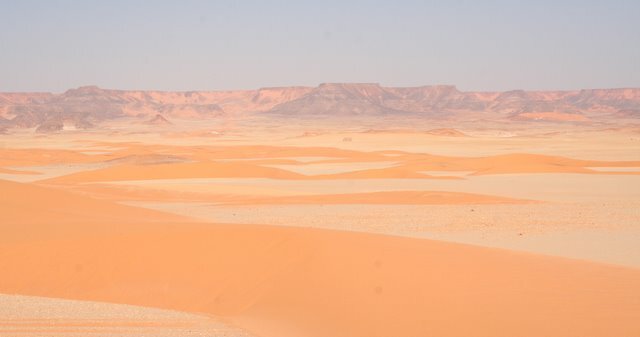 I was so enthralled by the colours that I refused to take my eyes off the sand dunes, even when my friend Mohamed, and then Mahmoud, came up to tentatively offer to help. I put my tent straight on the sand, to sleep near the men around the campfire. I had mentioned that I had my Ipod and could put on some music to play through the car speakers if people wanted. I had hardly used it. I had brought it as an isolating device if there should be people who want ed to talk all the time - but the whole group has been delightful and talking has been a pleasure. Even more, the places have demanded silence to fall between the gaps left by voices, so the stillness can feed in and around us and the silence is so total that it almost leaves you straining to hear anything at all. Heide had asked about Abba, and I assured her that I had an eclectic collection which did indeed include Abba. We ate, then I put on music. I had decided that Abba did not entirely suit the place, and instead chose the sound track of 1492, The Conquest of Paradise by Vangelis. It is currently almost my favourite piece of music. The choral voices - only men, floated out across the sand and the whole group fell into unusual silence until the whole CD was over. "That," said Jean-Daniel. "was absolutely beautiful - what was it." Then we put on Abba and some danced. It was a lovely night, cold and icy but so utterly still and beautiful. The moon was out over the sand and you could almost read by it, even though it was not the full moon we had had earlier in the trip. The men cosseted me. I know they had been so concerned about the coughing. Now Mohamed, the driver of the kitchen car set up my bed. I had dropped the mattress and rolled out my sleeping bag and the tiny feather cushion filler I was using as a pillow. Mohammed lifted the pillow, folded a camel blanket to a thick ridge and put it underneath - which both extended the length of the mattress and lifted my head higher. Another camel blanket was carefully folded around the whole bed. I drifted straight off to sleep with not one cough. As I sank into that warm and comfortable state that knows you are awake but could not be bothered moving I felt Mohamed beside me stand and move around the circle to check all of us. One after another he adjusted our blankets, Mahmoud's had shifted sideways, and he tucked it in. The captain's had slid back and he pulled it up over his shoulder. I was aware of gentle hands adjusting the heavy rug around my shoulders and weighting the sides with sand so it could not move. Nor could I, but then I didn't really want to. I slept like a log and did not use a tent again. I have just been teaching at Road to California. I loved it - the best combination of good organisation, nice and happy students, and I shared a room with Gloria Loughman who is probably my favourite Aussie tutor. However - I flew there. I have decided that I really do not like long flights. On the whole I endure them, but this seemed much worse than usual. It all started so badly that I should have realised. I had made bookings about six months ago and had noticed, and groaned over, the eight hour standover in Frankfurt. That seems worse when the flights are so long anyway. Driving through traffic in central Cairo one day with four people in the car and in a traffic jam which was not stationary enough to be quiet, but slow enough to have everyone leaning on horns, I had a call from my travel agent. She pointed out that I had eight hours in Frankfurt and would I like her to find a flight with less time to wait? Yes, I would. Well, she had. However - with eardrum-blasting sound levels combined with her strong Egyptian accent and the fact that the more I said I could not hear her, the more she shouted and the more my phone buzzed - I just could not work out most of what she was saying. I said that if I had less time at Frankfort I was happy for her to change the flights, and would trust her judgment. Dumb. I went off to Houston having made arrangements to have the ticket to California issued while I was away. I came back from Houston, and dropped the ticket into the ticket drawer and went off on my long desert trip. Yes, I know I still have the Great Sand Sea crossing to write up. I came back from the desert trip and my younger children arrived with my eldest grandson. I went on a Nile Cruise. I returned three days before Christmas and when the fuss and flurry and turkey was all over and my young ones departed to the White Desert I took time to glance at my tickets. There was the first leg - Cairo to Frankfurt. Then the second Frankfurt to Los Angeles. The connection was now so tight that it looked worrying and I muttered that another half hour might have been a bit better. Then I flicked over the page to look for the bit that took me from Los Angeles to Ontario. It wasn't there. They had changed my flight all right - and changed the destination. With only two weeks to go to a major teaching booking and a huge conference in a small satellite city - I had no way to get to the conference. Finally the agency found me flights - but now I had to route through San Francisco to get there, and through Denver to get home. Worse - the tight Frankfurt connection was now at critical point - one minor holdup and I simply would not get the flight. I finally received the new tickets only the day before I left. I had asked them to book seats for me for the flights - I like aisle seats near the front of the plane - especially with tight connecting flights. On the first flight I was near the back of the plane - though not in the final seat this time. Last time that I sat there they ran out of food. I could survive without, but the meals punctuate boredom and I was annoyed. Then they had to give me duck from the first class menu and I forgave them. We hovered over Frankfurt - and it was very bumpy. Then the pilot announced that there were very heavy headwinds and we were being put into a holding pattern. This was a matter for panic. Then I realised that my ticket actually had us landing an hour later and it was not as bad as it looked as the agency had not allowed for the time change to Germany and I had an extra hour. Then we circled for half an hour and finally landed. We taxied to our parking space - out on the outskirts of the terminal. The bus was late. I was still on the plane a long way from the terminal when my plane was supposed to be boarding. I was arriving at the terminal when it was supposed to take off. German security is very very thorough. I had to get a train to the new terminal area. then go through security. In Australia when in queues they keep calling for passengers who are booked on flights about to leave - and you jump to the front of the queue. In Germany they tell you if they let you through everyone will want to go. I had seen that my plane was still there but flashing a final call notice and I was only four gates away when I was in the security line - but stuck totally with all the unrelenting hopelessness of a Cairo Traffic jam but note of the kindness. We made it. Seven passengers sprinted almost neck and neck through the terminal and lunged for the gate - and they let us on with everyone else seated and tapping watches and looking daggers at us. The headwind that had slowed us on landing had also stopped us from taking off. However - now I was in the front bulkhead row. Good legroom perhaps - especially since I had managed to talk the woman who was occupying my seat to let me have it back. I should have left her to it. The sweet little eighteen month old angel sitting on her mother's lap beside me changed within seconds to a wailing and kicking virago. Then I realised that she did not have a seat - and I was facing a twelve hour flight beside a bad tempered toddler, and a couple of very indulgent women - one the toddler's mother, and one her grandmother. They were Algerian. Before we even took off they were telling me to sit somewhere else. I had been told the plane was full and said so. "No it isn't," said the older woman. "I know as I sell their tickets". Don't you hate it when people flatly contradict you when you are sure you are right. She immediately called over a hostess to complain that the baby woudl need the seat I was in and could I be shifted. I wasn't arguing much - I had been royally pummeled by the baby already and we had not even taken off - and her shriek was piercing. The hostess pointed out that the baby could not have a seat if it had not been paid for. She also said the flight was almost completely full. Then the meowing started - behind us. We took off. The meowing continued. I have actually never been on a flight with a cat in the cabin. It was in a cat carrier and it had a paid for seat! However they said the carrier could not actually be on the seat - it was just a way to make sure that it was in a cabin. Four men nearby complained to the hostess and she pointed out that the seat was paid for but she woudl move the girl and cat to another location if she could find one. It was at about this stage that the smells started. The baby contributed part of it with a nappy that obviously needed changing. Her mother had given her a bag of very sticky strong-smelling fruity sweets and she was sucking one, clutching another and my sleeve intermittently. Then a frightened and distressed cat fouled her cat cage. I managed to find another seat by pointing out to a hostess that the food tray in my seat was not folding out and I was very very uncomfortable. Finally I was wedged in a centre seat at the back of the plane but it was blissfully quiet - except that the ladies beside me looked daggers at me for daring to intrude on the empty space between them that they had counted on. We arrived over San Francisco. There were a few dark hills coming out of a pure white sea. San Francisco was fogged in. We went into holding pattern again. With a dreadful sense of deja vu I watched my watch as we circled and my connecting plane should have been loading. I had also realised that it was unlikely my luggage would catch up with me. We landed and I was last off the plane - they had stashed my bag when we were last on and it was not where I had been told it was. I still cannot believe it - but the fog that delayed us so long had also delayed all flights taking off and they were HOURS behind. I sat for three hours. By then I was feeling better about even the possibility that my luggage might make it. We loaded into the final flight - on United. We took off and I was feeling good - not even as tired as I had expected to be. As the seat belt light went off the hostess moved forward and started to set up the drinks trolley. She was gorgeous. Very tall - at least 5' 11''. She was very long legged, with the stunning body and marvelous strut of many African Americans. She secured the coffee pot on top and came forward. I was in the front row. She stopped beside me and asked what I would like. I said Ginger Ale - we cannot get this in Egypt. Without saying a word she took the trolley back. She removed the coffee from the top and lashed it back into place. I was utterly bewildered. What had I done to have her move away when I placed my order? Then she reached into a drawer. She pulled out a pair of surgical gloves and slowly and deliberately pulled them on. There is something terribly ominous about surgical gloves. She looked as if she was about to perform a very unpleasant medical examination. She moved slowly down the aisle to about two seats behind me and now I could see the problem. A couple were both vomiting into their airsickness bags. We had only just taken off. She removed the bags, replaced them with clean ones, removed the gloves and washed, and then set up the trolley again and brought me a ginger ale. My luggage did make it - but it was a memorable trip. Each evening when the sun has dipped and the sky has dimmed something magical happens to Cairo. The dirt and the dust disappears. The ugliness of tatty gingery buildings, litter laden streets, dingy battered cars, and forests of daisy-like satellite dishes on top of the flat roofs all vanishes. What is left is pools of yellow light gilding the buildings, bright neon lighting the sky and the black surface of the Nile reflects each light a dozen times in its ripples, and young couples, shoulder to shoulder - but rarely more - line the bridges and whisper dreams to each other. At night the whole city dreams. There are still car horns but somehow the sound becomes more festive. The mosque minarets are lit with grass-and-emerald green lights, and spires all over the city point elegant green fingers to the sky. There is not one star. The sky becomes a dusky red-purple as the perpetual Cairo smog reflects the lights of the city that throbs below. I sat last night in a window on the 20th floor overlooking the narrow edge of the Nile that wraps around the back of the island I live on. It is called Gezira and literally this is Island. They call our suburb Zamalek. Suburbs here seem to alternate grotty with elegant, defined mostly by the width of the streets. Narrow is grotty, wide boulevards are elegant - no matter how many lines of cars force themselves along the marked lanes. The Nile wraps around Gezira, two thirds on one side and one third on the other, and I was looking over the narrow strip. It is like a back entrance compared to the front one - less loved, without the grace element of feluccas drifting slowly under sail, lined by somewhat seedy 'houseboats' used as clubs and restaurants and places for wedding parties. Occasionally one of the little motor boats loved by Egyptians for happy Thursday night parties drifted through - hot pink, lime, scarlet and lemon neons flashing, and music blasting so loudly that remnants reached even the heights of the twentieth floor, to break through shouted conversations with thin thready drifts of Arabic music. A friend had volunteered a party for New Year's Eve and I was able to hog a seat in the window and withdraw a little from festivities. Our youngest daughter fitted in beautifully and I loved watching her mixing and chatting, and her bubble of a laugh gurgling through the other party sounds. Most of the group was young. I had several glasses of punch which I assumed - rather stupidly considering that it was a party for New Year's Eve in a Western house - that the punch contained nothing more lethal than fruit juice and tea. By the time I had had three glasses of it I was starting to realise that there may have been something more - as the initial glass of Moet and Chandon champagne was not enough to account for the fact that I was somewhat blurred and concentrating carefully on what I said. So - I sat in the window and mulled over the year that has just passed and how much I love this city - and how sad I will be to leave. We were looking down on the Fish Gardens - a park area not lit at night so it made a large black pool beneath the apartment block. Then the Nile. Then the busy and crowded streets of Aguza, and the high rise of Mohandiseen and Dokki behind. It has been such a privilege to live in a city like this - large and unwieldy and complicated and not always well behaved. I have had such joy here and probably equal frustration. I often think knowing the time I have is finite is easier as I know the annoyances are temporary and that the pleasures the same - so I make the most of the best things, and let the bad slide past to the keeper. The best this year was undoubtedly my trip to Gilf Kebir and Jebel Uweinat - and I promise I will finish the write-up in the next few days. The worst was coming in to my kitchen to find my dear chef profoundly distressed by the fact that he had collected his mother from her home to bring her to spend the evening with his family, and they both walked straight into an honour killing and saw the whole thing in terrible detail. His hands shook as he recounted what he had seen, and how the brother and father who had killed the young woman had just sat down beside her body and lit cigarettes until the police came to take them away. His mother had fainted against him, and he could not carry her away so was pinned there to watch, and it had all happened so fast that the group nearby had been too horrified to move until it was over. I still feel my own horror and our chef's frustration and he still occasionally talks about the murder - but his grief is all for the mother who lost her daughter, her son, and her husband all in one moment. Happy New Year to all those out there who read this blog. I feel sometimes that I talk to my friends when I write this, and yet most of you I have never met and might never meet. I started this to tell friends and family of my life here without having to mail out dozens of emails and risk missing people. This way my family and friends can choose to see what is happening, or not. Sometimes it feels almost as if I am dropping stones in a deep well, as it is an odd way to communicate - strangely one sided and quiet as I know there are a lot more readers than there are comments. Then I travel somewhere, and find that there is someone in a group who reads my blog - and I come back with a new burst of energy! Happy New Year. I hope for all of you and for all my dearly loved family and friends that the year will bring the best of what you hope for, and that the problems will be easily solved.